Now available from the good folks at LibriVox and narrator Ralph Snelson: The Son Of Tarzan by Edgar Rice Burroughs! 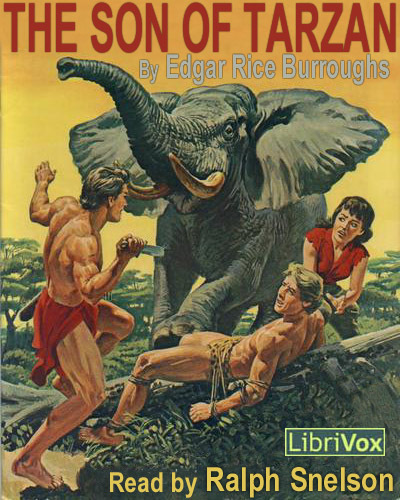 I’ve added this audiobook to our nifty EDGAR RICE BURROUGHS page. There you’ll find Books 1 and 3 in the Tarzan series as well. According to the LibriVox forums, Mr. Snelson is already working on Book 5 in the Tarzan series. The missing Book 2 is also in progress, but with multiple narrators. A complete FREE ERB audio library isn’t too far away now! This is the fourth of Burrough’s Tarzan novels. Alexis Paulvitch, a henchman of Tarzan’s now-deceased enemy, Nikolas Rokoff, survived his encounter with Tarzan in the third novel and wants to even the score.